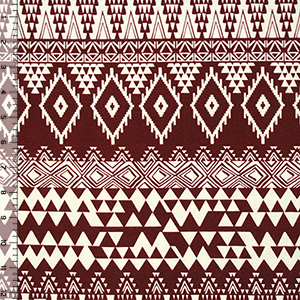 On trend maroon and creamy off white triangle diamond eye ethnic inspired design on a cotton spandex rayon blend knit. Fabric has a soft hand, 4 way stretch, a nice drape, and is lighter weight. Ethnic eye measures 3" (see image for scale). A versatile fabric great for many different applications!